Jana Reinhardt jewellery was founded in 2006 by master goldsmith Jana Reinhardt and her husband Ross Cutting. They are passionate about hand-crafting and only use traditional techniques, never machine manufacture, to create their fine jewellery collections and bespoke pieces. Jana and Ross work from their South Coast studio designing and making jewellery for people who appreciate the lighter side of life, exceptional workmanship and attention to detail. Each piece is as unique as the customer. 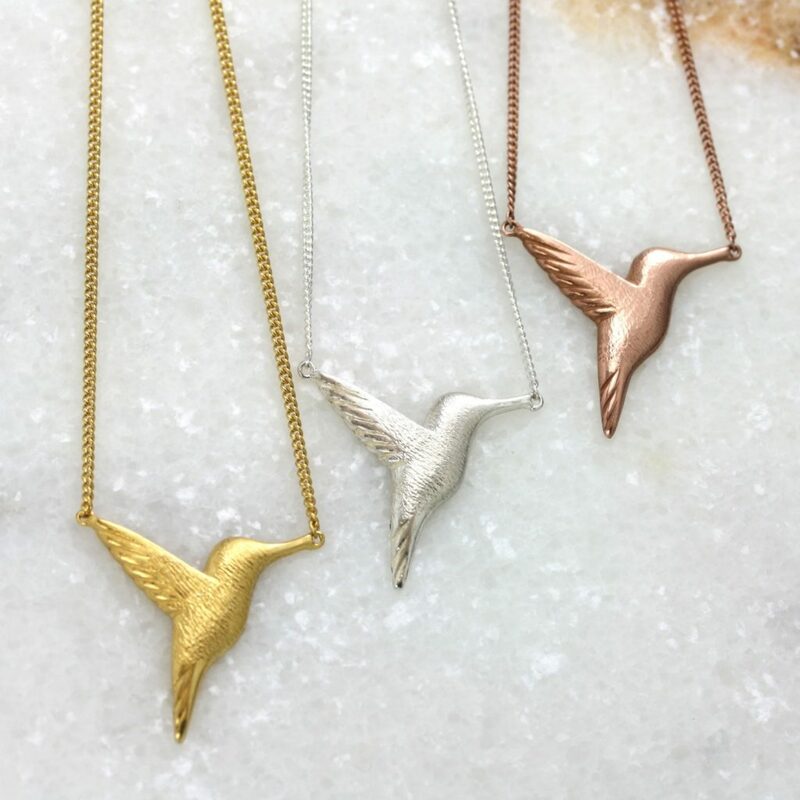 You can win this stunning handmade Hummingbird necklace by Jana Reinhardt jewellery, worth £89. Hummingbirds symbolise joy, playfulness, and lightness of being, all things which we could with a little more of! Made from 925 sterling silver, this unique pendant measures 2x2cm. It has an eye-catching textured finish, with a flat back so that it sits well on your clothes. Suspended on a matching silver fine 0.7mm curb chain, the necklace can be worn at 16 or 18 inches (41 or 46cm). To enter this competition all you have to do is complete the easy widget below. Giveaway will run until May 1st. Winner’s details will be passed to Jana Reinhardt, who are responsible for sending out the prize. The winner will be chosen at random from valid entries after the closing date. The prize includes free UK delivery. Yes I’ve bought handmade jewellery a few times, I love having something that’s been handmade. I bought my mother a handmade necklace from Etsy for her 70th birthday. Yes, I love handmade jewellery. I have and I love individualistic styling. Yes at craft fairs and such like always special. No I haven’t but would like to. No, I haven’t but seeing this I would like to. Yes, I love browsing at craft fairs, particularly ones that specialise in jewellery! I haven’t been able to buy jewellery for so long that I don’t remember when it was. It is lovely to see craftspeople make beautiful things like these. I have bought many items of handmade jewellery. I like to encourage small business such as this and I think that more love and attention goes into it rather than H Samuel items etc. No. I’ve made some jewellery myself but nothing as delicate and beautiful as this. I’ve bought a few pieces from China from a website where they advertise handmade jewellery, so yes, and I love them more because they’re unique! Yes, many times – I live in Bristol and there is lots of local handmade jewellery available. I have never bought hand made jewellery before, but I have made my own after doing a course at my local college. I’ve bought handmade jewellery before at a contemporary craft fair. It’s so great to see the artist, who you are buying from. I have had my wedding ring made for me. Most of my jewellery is from India and so is mostly hand-made. I like buying handmade jewellery from local markets and craft fairs because I like it to be special. These look beautiful! Yes, I have brought handmade jewellery and I have also been to a workshop and made my own. yes! i try and buy handmade for presents as i think it gives it that personal touch! Yes – it is lovely to have something which is not mass produced.